Are your students ready to take an online math course? About eMathReady Why eMathReady ? Do you need assistances? Please let us know how we can help you ? eMathready Pre-recorded Demo Video Coming Soon! we can better assist you. Are you the decision maker ? How soon are you planing on making a decision ? How many student do you currently have enrolled at your institution ? How many online courses do you offer at your instution during a regular term ? eMathReady™ also assesses whether a student planning on taking an online course. Ultimately, eMathReady™ was designed to empower institutions with the ability to make sure that their students who are planning on taking an online course are online ready. The flexibility, convenience and growing acceptance of online distance education is creating a new trend in how college students attend classes and earn their degrees. More and more students are gravitating not just towards blended courses where they attend class lectures and participate in online learning activities, but are selecting to enroll in fully online course programs or courses where more than 80 percent of all content is delivered online, and there are typically no face-to-face meetings with instructors. According figures from the National Center for Education Statistics (NCES) and the Sloan Consortium, an advocacy group for online education, the number of students enrolled in at least one distance education course increased significantly between 2002 and 2007, from 1.1 million to 12.2 million--and the growth spurt doesn't seem to be slowing down. The study, "Going the Distance: Online Education in the United States, 2011," also reports that more than 6.1 million students took at least one online class during fall 2010—a 10.1 percent increase over the year before. In fact, by next year, Ambient predicts that the number of students taking all of their classes online will increase to 3.55 million, while the number of students taking all of their courses in on-campus classrooms will drop to 5.14 million. This is definitely a paradigm shift in the way students are being and will continue to be educated in America. But, with countless studies showing success rates in online courses of only 50 per cent—as opposed to 70-to-75 percent for comparable face-to-face classes— isn't it time we asked ourselves some serious questions? Such as: Are students online ready? And, if not, what can institutions do to assure that students are ready to take an online course? As individuals, students also invest thousands of dollars in their education and may be hesitant to continue their education for fear that they might not do well. Institutions need to provide student with the means to assess their strengths and provide resources for them to strengthen their weaknesses because students who are confident of their readiness are much more likely to be successful in an online learning course. It is important that institutions provide prospective students considering taking an online course with the means to assess their level of readiness to learn in an online environment. The purpose of the assessment should be to determine the degree to which they possess attributes, skills and knowledge that contribute to success as online learners. And, in cases where students do not possess the attributes, skills and knowledge, institutions need to provide them with the necessary remediation/support in areas of deficiencies to promote effective online learning. Institutions need to also assist students with making the transition from traditional to online learning. 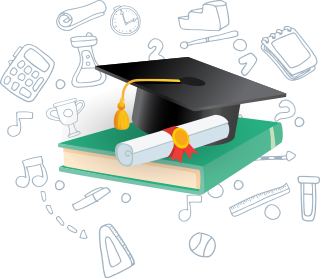 Ultimately, eMathReady was designed to empower institutions with the ability to make sure that their students who are planning on taking an online course areonline ready. Due to the flexibility, convenience, and growing acceptance of online distance education is creating a new trend in how college students attend classes and earn their degrees. More and more students are gravitating not just towards blended courses where they attend class lectures and participate in online learning activities, but are selecting to enroll in fully online course programs or courses where more than 80 percent of all content is delivered online, and there are typically no face-to-face meetings with instructors. 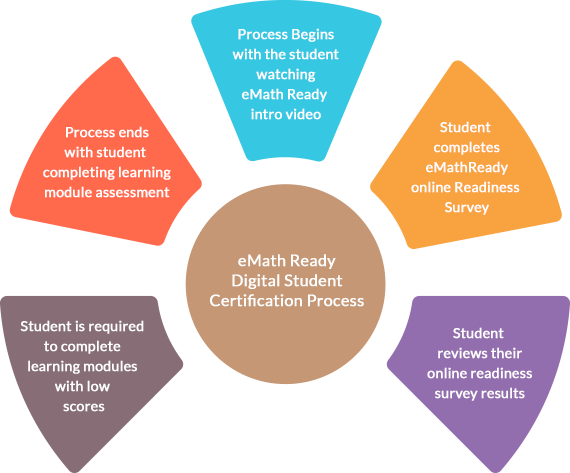 To combat this challenge, a student online readiness and support program, called eMathReady™, was developed to assess students likelihood to succeed in an online math course. The program also provided an indication of the degree to which an individual student possesses the attributes, skills and knowledge that contribute to success as an online learner. A Chi-Square test of independence to determine if there was a significant difference between the success rate of students who completed eMathReady™ and those did not complete eMathReady™. The study was conducted at an “open door” college, where students taking online college algebra and precalculus registered for two separate course sections of which one section completed eMathReady™ (experimental group) before taking their online course while the other section did not (control group). Students who completed eMathReady™ (control group) before taking their online math course had a 75% success rate (A, B, and Cs) and a 25% non-success rate (D, F, and Ws). The students who did not complete eMathReady™ (control group) had a 46% success rate and a 54% non-success rate. The experiential group had a 29% higher student success rate. Chi-Square test result was 4.27 with one degrees of freedom and a p-value of .039. The results represent a .05 significant level. From this results it appears that the students who completed eMathReady™ had a significantly higher pass rate. Students who completed eMathReady™ before taking their online math course had a 85% success rate (A, B, and Cs) and a 15% non-success rate (D, F, and Ws). The students who did not compete eMathReady™ (control group) had 55% success rate and a 45% non-success rate. The experimental group had a 30% higher success rate. Chi-Square test result was 5.38 with one degrees of freedom and a p-value of .020. The results represent a .05 significant level. From this results it appears that the students who completed eMathReady™ had a significantly higher pass rate. Accrediting agencies as well as other educational oversight groups have recognized the importance of measuring learner readiness for studying online, along with providing the necessary remediation and support to help the learner succeed. Several accrediting agencies require their member schools to document how they determine learner readiness and how they then provide the remediation and support necessary to help the learner succeed. "Employs ways to assess student readiness for course content and method of delivery"
"Employs ways for students to effectively evaluate and assess their own readiness for course content and method of delivery." "NEA has recognized the enormous potential of online learning -- as well as some of the potential disadvantage. In 2002, the Association adopted a comprehensive policy for online learning. For instance, "Students who take distance education courses should receive the preparation and support necessary to enable them to function effectively in an online environment"
View Presentation from Dr. Mac Adkins about how our services can meet SACS criteria. "Assists the prospective student in understanding independent learning expectations as well as the nature and potential challenges of learning in the program's technology based environment." This best practice is exactly what the eMathReadyMath Online Readiness Survey is designed to accomplish." "Informs the prospective student concerning technical competence required of students in the program." The Technical Competency of eMathReady is designed specifically to measure the student's technical competencies, along with provide students with the necessary remediation and support as appropriate." "The school must establish admission requirements for distance education programs and courses of study that assess whether students have the skills, competencies, and access to technology necessary to succeed in a distance education environment prior to their enrollment in the program or course of study." Please make sure that your computer meets all of the requirements detailed below before using eMathReady Note that you may need administrative access to be able to install applications or make other changes to your computer. If the computer you are using is not your own personal property, you may need to contact your organization's IT department to make such updates. To work successfully with eMathReady, your computer must match one of the supported browser and operating system (OS) configurations. eMathReadymay also run on newer versions of these browsers, but a version is not considered fully supported until it is specified. Most eMathReady courses support either Windows® or Macintosh® operating systems and a supported version of Microsoft Internet Explorer®, Firefox®, or Safari®. Other requirements vary, depending on the textbook in use for the course. Note that these requirements are only for eMathReady itself. Players or plug-ins may have their own system requirements. Cable/DSL, T1, or other high-speed for multimedia content; 56k modem (minimum) for eMathReady. Windows: Go to Start > Control Panel > Display > Settings > Screen Resolution. Is there a way we can try eMathReady out without commitment to determine how to best implement it at our institution? Institutions considering licensing eMathReady may qualify for a trial period. Click here to request more information. Why should our school use eMathReady instead of creating our own readiness assessment? Research and Development: eMathReady is based on strong research and has been developed by content and psychometric experts and learning specialist with over 40 years of combined experience in education. Since 2010 eMathReady has continuously evolved through the input of educators at over 25 educational institutions and educational technology and learning specialists. We have invested hundreds of thousands of dollars in the research and development of eMathReady. Remediation Resources: We have identified BEST online remedial resources to which we direct students in their remediation learning modules. Curricular Integration: eMathReady is planning on being integrated into several student success textbooks and orientation courses..
Security: eMathReady is hosted on dedicated servers in a state of the art data center with multi-city redundancy and fail safe power backup. Support: eMathReady comes with student and educator technical support. Your staff does not have to answer questions for students or help them log in. Hosting: eMathReady is a fully hosted solution which requires no tasking from your school's information technology department. Evolution: eMathReady is continually evolving based on the input of schools which are using eMathReady. We encourage all schools to make suggestions on how we can improve eMathReady. Your license cost remains the same even though the product is being continually enhanced. Training: As a eMathReady client institution, you can receive live training via an online webina. We provide the training to anyone in your institution who will be using eMathReady. You do not have to provide the training. Do you have any research about the effectiveness of eMathReady? Yes, please view the information by going to “more info” on the eMathReady log-in page. If you have any questions we will be able to assist you. By design, eMathReady is not intended to be a gatekeeper. eMathReady is intended to be used as a diagnostic tool to help students be aware of their strengths and opportunities for growth as they take distance learning courses. With eMathReady, students can find out if their learning attributes match online math courses by completing an Student Online Math Study Strategies Survey on the secured Web site. This survey give a student a total score and separate attribute scores indicating which learning attribute(s) the student needs to improve. The three main benefits of eMathReady are that it makes the student aware of their attributes, provide the necessary support to improve a student's probable chance of successful. What type of information does eMathReady acquire from students? In addition to a student's scores on the ermathready assessment, the only information which is collected includes name and email, along with learning module assessment scores. The Family Educational Rights and Privacy Act of 1974, commonly referred to as the Buckley Amendment, protects the rights of students by controlling the creation, maintenance, and access to educational records. It guarantees students' access to their academic records while prohibiting unauthorized access by others. eMathReady is fully compliant with FERPA. Access to eMathReady information: Only persons authorized by the student's school have access to eMathReady scores and information. Access is controlled by user names and passwords which eMathReady administrators are to keep confidential. Security of eMathReady information: All eMathReady data is securely stored. eMathReady is housed on a dedicated server in a Tier-1. The datacenter itself is monitored and supported by a group of onsite network administrators 7 days-a-week, 24 hours-a-day, 365 days-a-year.. Nature of eMathReady content: In addition to a student's scores on the eMathReady assessment, the only information which is collected may include name and email. No release to third party: No information including eMathReady scores or a student's contact information is ever released to a third party for any reason. The only entities which have access to the data are the student's school and the company which provides eMathReady – Smart Thinking Technologies, LLC and Academic Success Press, INC. The privacy statement below is available on the eMathReady website and informs students about the policies governing access to their eMathReady data: "I acknowledge that by continuing with the eMathReady assessment that I am allowing my scores to be viewed by selected staff of my educational institution. I understand that this information will only be used to assist me in evaluating my readiness to succeed in online courses. I also understand that the data may be used in aggregate to measure student success. I recognize that my contact information, including my email address, will never be released to third party for any reason." How long is the data from the student assessments stored? How many questions are in each section of eMathReady? How long does it take for students to complete eMathReady? An analysis of 735 students who completed the eMathReady Support Program for Online Math Students in one sitting (defined as less than 4.5 hours on average with 3 or less attributes with low scores) was conducted in August, 2013. The mean time for completion of the eMathReady online readiness and support program was 4 hrs 30 mins with a standard deviation of 30:19. The mode (the time that occurred most frequently) was 4:02. Is eMathReady hosted on our server or yours? Everything is hosted on eMathReady's server. eMathReady is housed on dedicated servers in a secure, high powered, redundant datacenter facility which is located in Provo, Utah, USA. The datacenter is monitored and supported by a group of onsite network administrators 7 days-a-week, 24 hours-a-day, 365 days-a-year. eMathReady utilizes both automated network monitoring as well as human intervention and oversight to keep data secured. Is the eMathReady information secured? Who has access to eMathReady information? Only persons authorized by the client institution have access to eMathReady scores and information. Access is controlled by user names and passwords which eMathReady administrators are to keep confidential. Since eMathReady requires students to enter their email address, who has access to that information? Administrators from the home institution have access to the emails. No one else. Will student information be released to third parties? No information is ever released to a third party for any reason. The only entities which have access to the data are the student's school and the company which provides eMathReady – Smart Thinking Technologies, LLC and Academic Success Press, INC. Our Privacy Statement below is available here and informs students about the policies governing access to their eMathReady data. Does eMathReady have support staff to help with possible technical difficulties? Support to students taking eMathReady is provided via an online support request ticketing system and a knowledge base. Links to a form through which students can request support. During business hours, support requests are answered within two hours. Depending on the volume of requests, many are answered within minutes. Requests received prior to 9:00 PM EST on weekdays are typically answered the same night with requests submitted later in the evening being answered at the start of business the following day. On weekends and holidays, a response can be expected within 24 hours. [You must be at least  years of age to use eMathReady.com. By using this website [and by agreeing to these terms and conditions] you warrant and represent that you are at least  years of age or an educational institution or parent has established an account or registered on your behalf]. Unless otherwise stated, STT and/or its licensors own the intellectual property rights in website and material on the website. Subject to the license below, all these intellectual property rights are reserved. Use materials obtained through the Services for commercial purposes. Where content is specifically made available for redistribution, it may only be redistributed within your organization only. any licensing terms between STT and your Institution. STT is not responsible for limitations of access resulting from any Third Party Service or as the result of certain account settings established by your Institution. You are responsible for obtaining adequate and/or sufficient Internet access in order to use the Services. You may access a Course available through the Services only for the duration of the Subscription purchased (typically four months depending on the licensing agreement), whether or not the Services are used and subject to STT's reserves the right to terminate access under this User Agreement. Educational institution access may be provided for an indefinite period of time or until otherwise terminated by STT. While STT makes reasonable efforts to ensure the availability of the Services to Authorized Users with active Subscriptions, the Services may be unavailable for limited periods of time due to scheduled routine maintenance, emergency maintenance or factors beyond STT's control, such as disruptions of internet services or unforeseen threats to the integrity or security of the Services. STT may at any time, with or without notice to you, restrict the use and accessibility of the Services and/or discontinue any portion, feature, or content of the Services. STT will make reasonable efforts to provide Authorized Users notice of significant changes to the Services to Authorized Users with active Subscriptions whenever reasonably feasible and provide alternative materials or services if substantial portions of the Services become unavailable. Your User Account is for your personal use only. Allowing others to access or use the Services through your User Account is strictly prohibited and you are responsible for all uses of the Services associated with your Account Credentials, whether the use is made by you personally or by a third party due to your disclosure of your Account Credentials. It is important that you protect and maintain the confidentiality and security of your Account Credentials. You agree not to (1) use Account Credentials other than your own, or (2) to disclose your Account Credentials to any third party or service, other than an authorized Third Party Service. You agree to take reasonable steps to protect the secrecy of your Account Credentials and immediately notify STT at info@emathmready.com of any known or suspected loss, disclosure or theft of your Account Credentials and/or access codes you obtain in connection with the Services. reproducing the website by any means, illustrations, charts, photographs, or outlines for distributing or sharing with third-party or other persons not license to use the Services. This website is provided “as is” without any representations or warranties, express or implied. STT makes no representations or warranties in relation to this website or the information and materials provided on this website. matter which it would be illegal or unlawful for STT to exclude or limit, or to attempt or purport to exclude or limit, its liability. STT assumes no responsibility for third party content ("Third Party Content"), services or applications that may be accessed by way of links on the Services to sites hosted by third parties that are outside of STT's control ("Third-Party Sites"). STT does not endorse or guarantee the accuracy, integrity or quality of Third Party Site or Third Party Content and disclaims all liability for any errors, omissions, violation of third-party rights or illegal conduct arising from such content or sites. The inclusion of a link to any Third Party Site in the Services does not imply that the owners of such Third-Party Sites have sponsored or endorsed the Services. STT is not responsible for the accessibility of Third-Party Sites accessed through links to the Services. Should you discover that a link to a Third-Party Site is no longer functional please contact us at:eMathReady Support. The website, Student Online Readiness Survey, Course materials, and other content provided through the Services (collectively, "Materials") and any supporting software, applications and systems (collectively "Applications") are the exclusive property of Smart Thinking Technologies, LLC and its affiliates, and/or its licensors, and are protected by U.S. and international copyright and other intellectual property laws. All rights not expressly granted herein are reserved. Except as may be set forth the reproduction, redistribution, modification, publication, or adaptation of Materials or Applications, in whole or in part, without the express written consent of STT and/or its licensors is strictly prohibited. The Services may allow you to copy or download certain Materials, but please remember that the availability of this functionality does not mean that the above restrictions do not apply. Unless otherwise indicated, trademarks, service marks and trade names (collectively "Marks") that appear on the Services are the property of STT or its licensors. Any trademarks not owned by STT that appear in the Services are the property of their respective owners. You agree not to misuse or disparage any Marks associated with the Services or use the Marks (or any confusingly similar marks) in such a way that would misrepresent the ownership of the Marks or otherwise confuse the public as to the source or origin of any products or services. You should not use any Mark without obtaining the written consent of the Mark owner, using appropriate notice and attribution of the owner's trademark rights, and using the Marks in accordance with applicable usage guidelines as provided by a Mark’s respective owner. Any such permitted use of the Marks by you shall be to the benefit of the respective Mark owner. You accept that, as a limited liability entity, STT has an interest in limiting the personal liability of its officers and employees. You agree that you will not bring any claim personally against STT’s officers or employees in respect of any losses you suffer in connection with the website. Without prejudice to the foregoing paragraph, you agree that the limitations of warranties and liability set out in this website disclaimer will protect STT officers, employees, agents, subsidiaries, successors, assigns and sub-contractors as well as STT. You hereby agree to indemnify and hold harmless STT from and against any and all claims, charges, demands, damages, liabilities, losses, expenses, and liabilities of whatever nature and howsoever arising (including but not limited to any legal or other professional fees and the costs of defending or prosecuting any claim and any loss of profit, goodwill, and any other direct or consequential loss) incurred or suffered by STT directly or indirectly by reason of any act or omission which you commit in breach of these terms and conditions and the obligations and warranties contained in them. Without prejudice to STT’s other rights under these terms and conditions, if you breach these terms and conditions in any way, STT may take such action as STT deems appropriate to deal with the breach, including suspending your access to the website, prohibiting you from accessing the website, blocking computers using your IP address from accessing the website, contacting your internet service provider to request that they block your access to the website and/or bringing court proceedings against you. STT may revise these terms and conditions from time-to-time. Revised terms and conditions will apply to the use of this website from the date of the publication of the revised terms and conditions on this website. Please check this page regularly to ensure you are familiar with the current version. STT may transfer, sub-contract or otherwise deal with STT’s rights and/or obligations under these terms and conditions without notifying you or obtaining your consent. These terms and conditions will be governed by and construed in accordance with GOVERNING LAW, and any disputes relating to these terms and conditions will be subject to the [non-]exclusive jurisdiction of the courts of Florida. You can contact eMathReady Support with questions or concerns about this User Agreement. This website, emthready.com (the “Site”), is owned and operated by Smart Thinking Technologies, LLC (STT). STT recognizes the importance of explaining our privacy policies to users of our Site and protecting the privacy of Personally Identifiable Information we obtain through the site. Please note that this Privacy Statement may be revised by STT from time to time, particularly to address changes in our business, the law or technology. If that happens, we will post the revised policy here. Revisions are effective upon posting and your continued use of this Site after the posting will be subject to the changed terms of the revisions. Customer - means a purchaser of the Services. Educator - means an instructor, tutor, teacher, professor, school, school district, college, university or other education institution or education agency that adopts or uses the Services in an educational setting. Educator includes a parent instructing a student at home. STT - means STT Technologies, Inc. and its affiliated companies. Personal Information (PI) - means information personally identifiable to a particular User. User - means a student, instructor or school administrator, who is an end-user of the Services. Institution - means a school, school district, college, university or other education institution or education agency that adopts and uses the Services. To protect Personal Information from unauthorized access, use and disclosure, STT maintains a comprehensive information security program and employs reasonable and appropriate physical, administrative and technical safeguards. STT consider the following to be examples of Personally Identifiable Information but there may be others: your first and last name and email address, if it is linked with your Personally Identifiable Information. We strongly recommend that you not use your Social Security Number or any other important ID as a user ID or password for this Site or others. STT may use a third party service to collect anonymous visitor information like IP addresses, browser types (such as Internet Explorer or Netscape), referring pages, pages visited and time spent on a particular page. STT collects this information (1) for statistical analysis of web page traffic patterns; (2) to administer our Site and servers; and (3) for internal purposes to provide the most effective and efficient features, functions, and services to our users. STT may communicate with Users by email to provide updates and information about the Services and to request User evaluation and feedback about the Services and interest in STT research project participation. In such cases, STT will provide Users with a means to express email preferences or unsubscribe to emails in accordance with applicable law. SPECIAL NOTICE TO PARENTS AND CHILDREN PARENTS:<>STT encourage parents and/or guardians to spend time with their Children (Children 12 and under) when their Children engage in the on-line activities on this Site. STT will never request Personally Identifiable Information from a Child in any of our public postings areas. STT do not require a Child to disclose more Personally Identifiable Information, than is reasonably necessary to participate in the on-line activity. No Personally Identifiable Information of children should be submitted to or posted on this Site by Children without the consent of their parent or guardian. STT encourage parents to help us protect their Children’s privacy by instructing them never to provide Personally Identifiable Information on this Site or any other website without parental permission. CHILDREN:Please do not give your full name, email address, home address, telephone number or any other Personally Identifiable Information that would enable someone to contact you either on-line or off-line, without first asking your parent or guardian for permission. STT do not knowingly collect Personally Identifiable Information from Children on this Site either directly or passively except when a Child may voluntarily submit such information through a “Contact Us” link on the Site or a public posting area on the Site, if such feature is available. If a Child e-mails us via a “Contact Us” link on any child-directed area of this Site and we can identify the sender as a Child, any Personally Identifiable Information submitted will only be used to respond on a one-time basis to such Child. In addition, if STT have actual knowledge that a Child is sending or posting Personally Identifiable Information on any area of this Site, STT will use commercially reasonable efforts to delete such Personally Identifiable Information before it is made public. STT may disclose a Child’s Personally Identifiable Information if we have reason to believe that disclosing this information is necessary to identify, contact or bring legal action against someone who may be causing injury to or interference with (either intentionally or unintentionally) our rights or property, other users, or anyone else that could be harmed by such activities. We may also disclose a Child’s Personally Identifiable Information when we believe in good faith that the law requires it. If a Customer purchases the Services online directly from STT, payment data submitted by that Customer will be used and disclosed to the Customer’s financial institution and STT’s payment processing vendor for the purpose of processing payment for the Services ordered. STT collects and processes Account Data to set up, maintain and enable a User account to use the Services. Account Data includes only a User’s name (unless an approved Educator or Institution alias is used), email address, user name and password, as well as the Institution and course identifier for any courses for which User uses the Services. A User may be registered for a User account using an Educator or Institution approved Educator or Institution alias* instead of actual first and last name. A User account may be established by using an Educator or Institution approved alias name (pseudonym) and email address that is not otherwise associated with Personal Information provided to STT. If a User establishes a User account through Alias Registration, the User must notify each Educator of the alias information used to establish the User account so that the Educator can recognize the User account as belonging to that User. Note: If a User account is established through integration with a third party service or if the Institution or Educator establishes the User Account or otherwise prohibits the use of this option, then Alias Registration may not be available. STT Site uses “cookies” to obtain certain types of information when your Web browser accesses the Site, Cookies are textual identifiers that our systems transfer to your computer’s hard drive through your Web browser to enable our Site to recognize your browser, and to optimize and sometimes customize your use of our Site. If you want to disable cookies, you can. The Help portion of the toolbar on most browsers and “add-on” programs will tell you how to prevent your browser from accepting new cookies, how to have the browser notify you when you receive a new cookie, or how to disable cookies altogether. It is your choice, but cookies allow you to take full advantage of this Site’s features, and STT recommend that you leave them turned on. In connection with cookies STT may use web beacons to track response rates to certain email communications that a user has opted to receive from us. If a user has registered with our Site, we may collect certain personal information in connection with the web beacon including the referring email address. This information is not shared with third parties. To improve our website-emathredy.com does this because we continually strive to improve our website offerings based on the information and feedback we receive from you. To process transactions-your information, whether public or private, will not be sold, exchanged, transferred, or given to any other company for any reason whatsoever, without your consent, other than for the express purpose of delivering the purchased product or service requested. To send periodic emails-the email address you provide may be used to send you information, respond to inquiries, and/or other requests or questions. Application and system logs are critical to ensuring the availability and security of the Services. STT automatically collects log data related to User interaction with the eMathReady Services. This data may include browser type, type of computer/device and technical information about the User’s means of connection to the Services, such as operating system, internet service provider and IP address. This data is collected and used to monitor the health of the Services, detect unauthorized access and fraudulent activity, prevent and respond to security incidents and appropriately scale the computing resources for the Services. FERPA - STT complies with all applicable provisions of the United States Family Educational Rights and Privacy Act, 20 U.S.C. 1232g, 34 CFR Part 99 (FERPA) in receiving and handling personally identifiable information from education records as a "school official" under FERPA. COPA – Our services are designed for Higher Education and Secondary Education. The Services are not designed or intended to collect Personal Information from young children under the age of 13 for any commercial purpose. In the event the Children’s Online Privacy Protection Act (COPPA), 15 U.S.C. 6501 et seq. is deemed to apply to the collection of any Personal Information under this Agreement, STT will comply with all applicable provisions of COPPA and collect and such information for educational purposes only at the direction of the Educator and on the basis of Educator consent. STT is committed to complying with all other data protection laws applicable to its delivery of the Services. You are now ready to use eMathReady Student Online Readiness and Support Program. Step 1: Go to eMathReady.com and Register as a Student. Step 2: Enter your First Name, Last Name, Email, eMathReady Reference Number (ERN) provided to you by your instructor. NOTE: You will not be able to register with your ERN. You will also need to use the same email address you used when you purchased the access code. Step 3: Create a password. Congratulations! Please note access code carefully. This code is valid for only 4 months.